A soon-to-be Energy Star of office furniture, NEAT certification proves that a product enables, motivates, or tracks Non-Exercise Activity Thermogenesis—the energy we expend through non-exercise movement like walking, standing, balancing, or fidgeting. Only a handful of brands have received the NEAT seal of approval so far. Ever the pioneer, iMovR received the NEAT certification for all its desks, meeting tables, sit-stand converters, and even standing mats. Walking and standing are the two activities against which all the other products are usually tested during NEAT certification process. It’s been proven that walking at 1mph raises energy expenditure by 139.7%, at 2mph by 210.5%, and at 3mph by 319.9%. The increase in energy expenditure during standing is modest in comparison—16.7%, but it is enough to exceed the certification requirement. If treadmill desks are inherently NEAT, standing mats do their magic indirectly by prolonging the time you can work at your standing desk or desk converter, hence, burning more calories than if you’d spend that time resting (i.e. sitting). Summary: CoreChair is one of the only two active chairs that received the NEAT certification. Featuring only lumbar support, CoreChair acts as a balance ball—a popular office chair alternative—tilting 14 degrees in all directions. And it helps to boost energy expenditure by 17% over stationary sitting. Designed to exceed BIFMA durability standards, CoreChair has been used in research by Mayo Clinic, Arizona State University, and University of Waterloo. Summary: Move chair by Varier is technically a stool. It keeps you in an upright position while sitting but also allows you to tilt and move whenever you want, which is unlike other balance chairs that rather force continuous movement. The stool was tested earlier this year and was found to increase energy expenditure by 18%—almost the same amount of additional energy you can spend while using a balance board. Summary: Cubii was the first under desk elliptical to get NEAT certification. Testing at Mayo showed that the device falls right between balancing (standing or sitting) and walking in terms of energy expenditure. Cubii raises calorie burn by 84.5%, while a fidget board will burn around 20% more calories than sitting. Summary: Designed by a former Broadway star and entrepreneur Robin B. Palmer, FlyteBike is the first desk cycle to receive NEAT certification. It burns 11.5% more calories than Cubii, which totals at 96% over sitting. FlyteBike is second in its category of portable (foldable) under desk pedals. It weighs only 3 lbs and comes with a chair strap for better unit travel control, which is a slight improvement on the first unit in its category—Stamina InStride Folding Cycle. Summary: A balance board is a good way to prolong your standing time, because it relieves tension in hip joints and ankles. It also cranks up the energy expenditure by 2.5% over standing (16.7%), bringing it around 20%. The Level by FluidStance is the first balance board to receive NEAT certification, and even though it is the only product to have been tested, we’re sure the rest of the brand’s line up is as NEAT as The Level. Since not all balance boards are created equal, we wonder if a board’s level of difficulty can significantly impact the percentage of energy expenditure. Summary: Hovr is a newcomer to office fitness, and it is an innovative one. A playful-looking foot swing comes with an under desk mount as well as a separate stand for those who don’t own their desks or would rather not use wood screws on their desktops. Hovr was shown to increase calorie expenditure by good 20% and can be used with any regular chair. This seems like a good option for those who can’t stand due to knee and spine injuries or other health problems as well as fidgety kids. 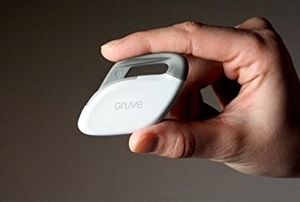 The activity tracker designed by Gruve Technologies was the very first product to receive NEAT certification when it was introduced in 2013. Unfortunately, since then the company has gone out of business. As much as it is an important aspect when shopping for office fitness furniture, NEAT certification shouldn’t be the sole deciding factor for purchase. Ergonomics is crucial when it comes to setting up a workstation, active or otherwise. Want to keep an eye on NEAT-certified fitness products? Sign up for our Newsletter. 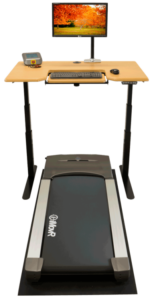 For those of us using treadmill desks, I would like someone to manufacture a bench that straddles a treadmill so that I can sit after walking several hours on my treadmill but still work on my computer at my treadmill desk. In other words, the legs have to be wide enough apart to straddle the treadmill deck, the height has to be adjustable so that it can be used at standing desks of varying heights, and the bench has to have a comfortable cushion. Also needs a bar across the front for your feet. The advantage is that this bench could be pushed to the rear of the treadmill while the treadmill is in use, and when tired, just slide it forward to sit. I’m going to have a prototype made by a furniture maker, but I really think those of you in this business are missing an opportunity to provide another product for those of using treadmill desks!! Do you know of any company that is, or would be interested in, manufacturing such a product?